It's hard enough to start a new social services agency. Imagine if a few months after you started your city was nearly destroyed by one of the greatest natural disasters in history! That's what happened to "In This Together Incorporated," an ASO based in New Orleans. We got the full story from Michael Hickerson and David Munroe, who founded the new agency together. "David and I live in Treme, the oldest predominantly African-American neighborhood in the country," Michael told us. "Treme is on the back side of the French Quarter in New Orleans, away from the river. It is the number one site in the state of Louisiana for HIV infection. It was our sense that little was being done that addressed the problem in the community. Other social service agencies were doing their best and doing a good job, but they weren't connected to the community." Michael had years of professional experience dealing with HIV as a social worker, and David had done volunteer work on a local, state and federal level. They applied for funding in the late Fall of 2004, and the new agency opened its doors with funding for one case management professional-Michael-in 2005. On August 29, 2005, the new agency-along with the rest of New Orleans-was shut down by Hurricane Katrina. "We evacuated to Baton Rouge," David says. "We left expecting to be gone two days, and we were gone for four weeks. Michael hooked up with an ASO in Baton Rouge, and went looking for people who needed help in the Red Cross and FEMA shelters. The people with HIV were flying undercover. A third-party would come up and say, 'Someone wants to meet you in the lobby.' They didn't want anyone to know." "We were getting calls from friends saying, 'I don't know what to do, I'm running out of medicine,'" Michael recalls. "I began to make phone calls, trying to find the services. We weren't familiar with the services in Baton Rouge, it was a different infrastructure. We had to learn, and it was challenging. We did what we could, and it helped." Four weeks after the storm hit, Michael and David came back to New Orleans to meet an insurance adjuster at their house. "The neighborhood was dead," David says. "There had been four feet of water in the house. Then we went to the office on Canal Street. The first floor had water damage, but the office is on the third floor. Michael flipped on the lights and turned on the computer-everything worked. 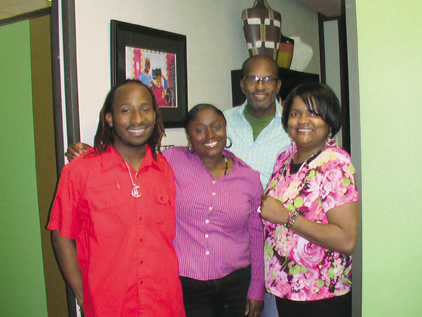 We were the only Title 1 agency in New Orleans that wasn't damaged." 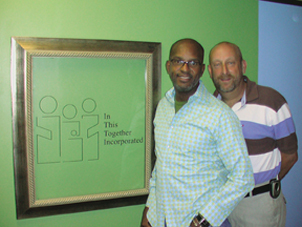 "In This Together" founders Michael Hickerson, MSW, RSW (left) and David Munroe. Michael and David returned to Baton Rouge for another two weeks, then came back to New Orleans and went to work. "Since Michael was the only employee, we could move fast," David said. "The city allowed us to hire another case manager immediately because the need was so great." "We were overwhelmed," Michael says. "But we did it." The following year, in March of 2006, In This Together received funding to hire five more staff people, for a total of seven. "Having served 170 people already-the majority of them African-Americans-is a testament to the agency's ability to respond very quickly, and the community's willingness to trust us to help them," Michael says. "When we first got the idea for this agency, we talked about what to call it," David recalls. "We didn't want to put HIV or AIDS in the name, because it scares people away. We settled on "In This Together." It's an amazing coincidence that the name has become so appropriate after what New Orleans has been through. We are all in this together. We are them and they are us." You can reach In This Together Incorporated by phone at 504-962-3245 or by e-mail at itt@accesscom.net. Their web address is inthistogether.org.